Unlike the popular space race films that have come before it, not a millisecond of First Man feels like typical hero worship celebrating astronaut and aeronautical engineer Neil Armstrong. The music or soundtrack doesn't announce his entrances or achievements. The camera doesn't bathe Armstrong in light and genuflect in his presence to make him seem larger than he really is. What is not trumpeted as heaps of grandiose praise by Academy Award-winning La La Land director Damien Chazelle is instead honed into a poignant and resolute testament of honor. The picture remains as stalwart as the man himself. First Man commemorates its central figure, a name forever chiseled in American and world history, as a man no larger than his own small steps in a ambitiously united mission. The cinematic monument set before us trades braggadocio and self-importance for spellbinding danger armored with colossal resolve. Created with breathtaking filmmaking dexterity and a meticulous attention to authenticity, First Man seizes viewers and thrusts them into these harrowing capsule cockpits and test modules. From the opening scene onward, you wrestle every shake and shimmy and every torque and tug that challenge the pilots’ senses and faculties (hand the Oscar right now to sound designer Ai-Ling Lee). What is even more stupendous is how the quiet personal elements carry a grip even firmer than rolls, pitches, and yaws that barrel these men into the unknown heavens. Based on Armstrong’s only official biography, First Man: The Life of Neil Armstrong by James R. Hansen, this film was made with the primary motive of examining the man more than the achievement. Spanning his test pilot days before NASA in 1961 through Apollo 11’s pinnacle in 1969, the clock is turned back on the reclusive man who avoided the post-milestone limelight to show the modest and intelligent qualities of stability that defined his work. Often highlighted by glimpses of his gold wedding band, gazes towards our celestial neighbor, or playing Les Baxter’s Lunar Rhapsody, Ryan Gosling encapsulates those introspective ideals by matching the subject’s perfectionism with acute and focused intensity of his own. Lockstep with her own reserve is The Queen Emmy winner Claire Foy as Janet Armstrong. Foy demonstrates stout impact to elevate the waiting-by-radio stereotype spouse into her own pillar of composure. Their reimagined El Lago, Texas home contained their shared loves and withheld fears, and the actors collide with excellent spousal chemistry. 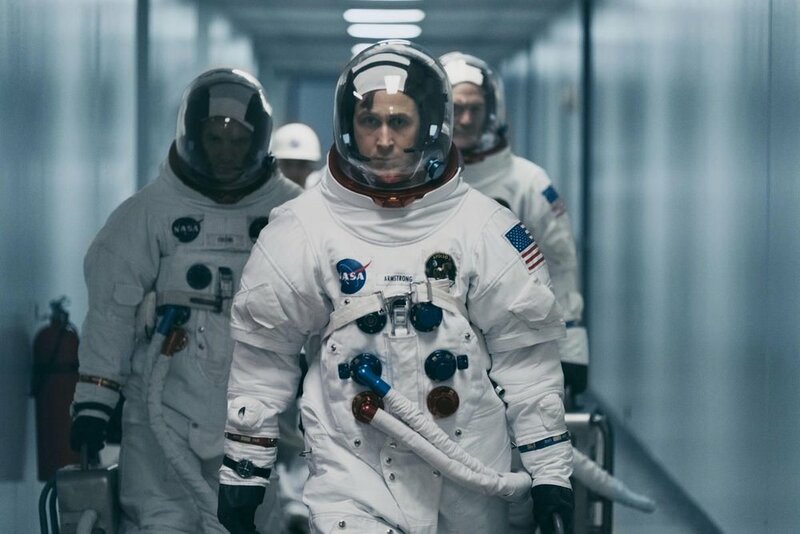 LESSON #1: THE GRIEF OF LOSING A CHILD-- Several scenes in First Man paint a near Malick-like painful domesticity that observes the reverberations and memories of parents grieving the death of a child. The passing of his daughter Karen before joining Project Gemini tormented Neil for years. The heavy thematic and symbolic anchor of his unspoken heartbreak fueled his quest for catharsis, not celebrity, to balance his sacrifices. LESSON #3: THE TRAIT OF RELENTLESS DETERMINATION-- Neil Armstrong and NASA pushed forward with unwavering will towards their goals. When you couple Armstrong’s aforementioned wounds of familial grief with the brotherly losses of peers, the sorrowful damage reveals the heartwarming strength found within his vital core. This man and his fellow astronauts had no quit in them whatsoever. No one balked at the price of excellence. Their determination compelled them to no end, and it is impossible not to respect seeing that on display. Beyond the profound narrative lies an artistic and technical marvel. NASA welcomed the filmmakers with pride to their databases and archival treasure trove, providing details that dazzle at every strap and rivet. Damien Chazelle reenlisted key fellow Oscar-winning La La Land collaborators like editor Tom Cross and composer Justin Hurwitz to shift away from the whimsy of their musical homage or the acidity of Whiplash for something brawny and brassy. Mirroring the story’s own technological barriers, cinematographer and camera operator Linus Sandgren engages the screen with unyielding POV peril in cramped spaces and broad LED-backed recreations of hallmark historical footage. His tight lenses shine on the period-perfect materials fabricated by production designer Nathan Crowley (Dunkirk and The Greatest Showman), set decorator Kathy Lucas (Foxcatcher), and the Coen Brothers’ regular costume designer Mary Zophres. A final bit of movie magic twinkles from VFX supervisor Paul Lambert (Blade Runner 2049) seamlessly merging full scale shots with Ian Hunter’s 3D-printed miniature creations and effects. Chazelle’s combination of sheer suspense and titanium fortitude within the historical sweep and high personal drama in First Man create tangible history within theatrical presentation. With gumption and reality, he takes something iconic and forges it into a opus of compelling human strength. Oscar-winning Spotlight screenwriter Josh Singer crafted a sober and serious central protagonist journey that cuts as powerfully as the boosters rocketing these men beyond the stratosphere leading to a supreme climax of unbound emotional release for the characters and the audience. For known history to become such a taut thriller defies all casual expectations.